It’s nearly time for a new season of Star Wars™: Armada Organized Play. That means more chances to play, opportunities to meet new players, and battles for your newest fleets. More than this, the upcoming tournament season means that your Fleet Patrol tourneys will now be supported by a whole new array of tournament prizes! 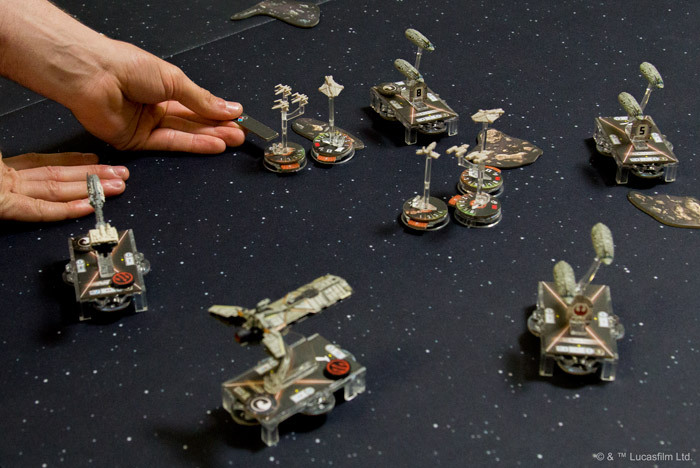 As the game of epic Star Wars fleet battles, Armada lives and dies with its capital ships. They are the backbone of your fleet, your hammer, and your shield. They boast the firepower, the command structure, the shields and hull, and the ability to influence the course of battles that will echo throughout the galaxy. All the same, there’s a lot to be said for the fighter squadrons these ships deploy into battle or that accompany them as escorts. While a single fighter—even a single fighter squadron—is no match for a capital ship, their tactical value is unquestionable. Like swarms of insects, fighter squadrons can eat away at larger ships. They can move you toward your objective. And they can prevent your opponents’ fighters from biting at your larger ships or advancing your opponents toward their goals. These tactical fighters feature prominently among the Season One prizes for Armada, and the best part is that you don’t even have to place among the top tables to claim your share of fighter glory. Prizes are awarded to each of the Top 16 players, with each of the Top 4 able to choose from an additional assortment of Elite Prize Cards and Elite Prize Items. Top 16: Alternate art Expanded Hangar Bay. The top sixteen participants in each Fleet Patrol event—or at whatever event your retailer runs with its Season One Armada kit—each receive an alternate art copy of the ever-popular Expanded Hangar Bay. 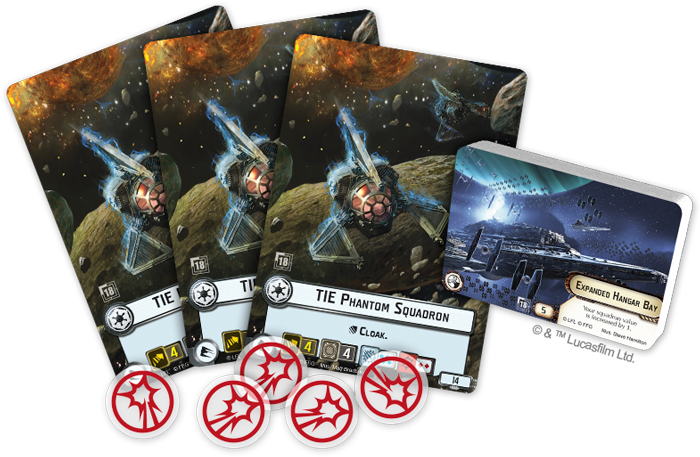 Even as it increases your ship’s squadron value by one, the card inspires fear with artwork depicting the full strength of an Imperial fleet consisting of multiple Star Destroyers and countless TIE fighters! Elite Prize Card: Alternate art TIE Phantom Squadron. Celebrate your success with an alternate art TIE Phantom Squadron. Are they cloaking or decloaking? It’s hard to tell. But then again it’s always hard to tell when and where these powerful fighters are going to strike. Elite Prize Item: Set of five acrylic Concentrate Fire tokens. To the victor go the spoils—such as one of two sets of five custom Concentrate Fire tokens each. Made of acrylic and frosted white with red paint, these tokens do more than ensure your shots hit for maximum impact—they look good doing it. What will happen when your fleet launches into the heated battles of Star Wars: Armada Organized Play? Will you lure your opponents into your carefully designed traps? Will you charge forward and lay waste to enemy ships with your missiles, torpedoes, and turbolasers? Will you free the galaxy from Imperial oppression? Or will you teach the Rebel scum a valuable lesson? Go forth. Experiment with new ships, squadrons, and tactics. Meet new players. Play more games. Armada Organized Play is all about you having fun with your starships, fighters, and friends!